It's really nice having good internet access right on the boat. It means that I can upload pictures and actually make a blog post about stuff we did today (and the last couple of days). Yay. So, first off we have some pictures from the trip over here. It was a fairly easy passage. The seas were a bit lumpier than we'd like but nothing too horrible. Once we got into the lee of Huahine, the seas were nice and calm. The trip to the south end of the island once we got into the lagoon was no problem. Yesterday (the 16th), we went to shore and walked around for a while. We walked down to the very south end of the island to take a look at the pass we want to surf. Unfortunately, the wind has been blowing a bit too hard and the surf was all choppy and ugly looking. The wind is forecast to drop in a few days so we'll probably stick around and hope things smooth out. This wave is a right (most of the wave around these parts seem to be lefts - and we don't like those) and is supposed to be pretty mellow. After our experience in Tahiti we're looking forward to a mellow wave. We know our limits. Today, we rented a couple of poorly maintained and too small for us mountain bikes and rode them around Huahine Iti (iti means small). Huahine is actually two islands separated by a very narrow, river sized bit of lagoon. Actually, I guess it's not really separated because there's a bridge that connects the two. At any rate, we just rode around the slightly smaller southern island. Given how out of shape we are from sitting around on a boat all the time, that was plenty. We also ran into our friends Stephen and Heidi from S/V Narama. They had also rented bikes and were riding around the island but they were more ambitious. They were riding around both islands. It was the first we'd seen of them since Tahanea in the Tuamotus so it was good to catch up. The island is beautiful. It reminds me of a more laid back, more friendly, and less touristy version of Moorea. The people don't seem quite as amazingly friendly as the Marquesians but, then again, almost nobody on earth is that friendly. We haven't really checked out the snorkeling and diving here yet but if that turns out to be as good as it is in Moorea, I can't see any reason to spend a vacation in Moorea rather than here. 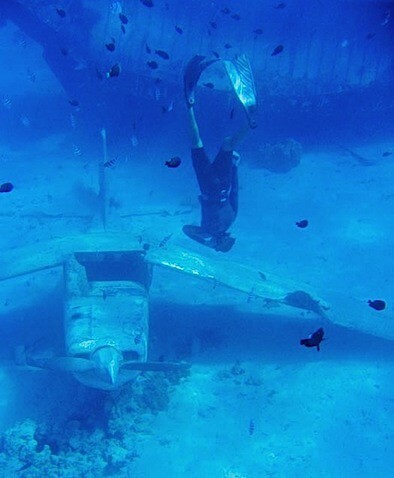 On a totally unrelated note, I found a picture of me free diving on a sunken airplane on our friends blog. I tagged along with the folks from Ceilydh (and several other boats) and they took a picture of me and I didn't even know it until I checked their blog this evening. So I guess we are going to have to go to Huahine then. We will be in the Society's for a month or so and Plan on being in Tonga for the Start of the Rucby world cup on September 4. Do you guys have any information on the cooks as it is a lost space for us at the moment so we are not sure if we want to go there or not.